EPFO UAN Login Procedure, How to login into UAN Member Portal for the First Time at unifiedportal-mem.epfindia.gov.in, How to get UAN Member Portal Login Details. Employees’ Provident Fund Organization (EPFO) has allotted a 12 digit Universal Account Number for the employees contributing to the Employee’s Provident Fund (EPF). All the services of EPFO are linked with this 12 digit Universal Account Number (UAN). This universal number is a unique number. so, all EPF members/ holders don’t forget/ avoid this number. When you changing your job, the UAN number can not be changed. At the time of changing your job, go and contact the current employer. The employer will request to the EPFO to generate a new member ID for you. 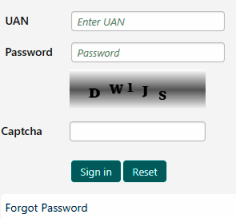 In case, if you forget/ lost the UAN, we have also provided the procedure on how to get the UAN forget Password. If you forget/ lost your password click on below link and get your password. In that page you can see the login form (Placed at the Right-side), you can see the image in below.